I am doing the Bead Peeps Swap N Hop hosted by Linda Anderson again this year. Again, participants have been paired up with other jewellery designers (from all over the world) and each will send the other a package of beads, a clasp, and a focal piece. Participants then create one or more pieces of jewellery with the goodies. Thank you Linda! My partner is Claire Fabian. Claire lives in Leipzig, Germany. Claire makes jewelry using many different techniques. She loves to experiment, to try new techniques and materials. She makes some of her beads and components using clay and polymer clay. Besides being a jewelry designer and maker, Claire is also a biologist working in research, especially with a focus on stem cell biology and therapy. Claire enjoys using art beads in her jewelry. For these earrings Claire used headpins from Kimberly Rogers (numinosity beads) and small beads from Julie Wong Sontag (ugliebeads). Claire likes experimenting with layering gold leaf and acrylic paint to make jewelry out of polymer clay like these pretty ear studs. Claire has created simple, sweet but elegant bracelets using small Czech flower beads and waxed linen. 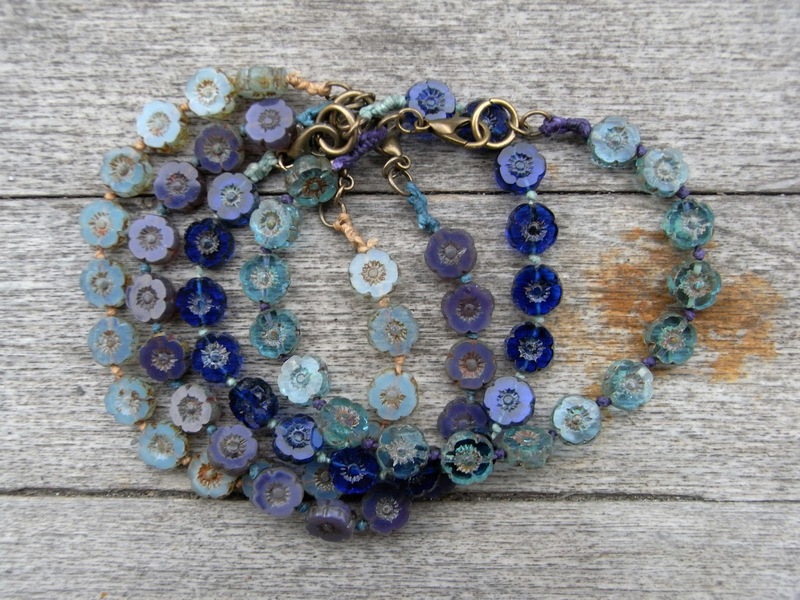 The colors of the waxed linen cord complements the colors of the flower beads. I hope Claire will enjoy using the beads I send her. I am sure I will like what she sends me. This entry was posted in art glass, beadmaking, Claire Fabian, handmade beads, handmade jewelry, jewelry, lampwork beads, saraccino, Uncategorized. Bookmark the permalink.